Studio Kaeth is the ideal place for people who love products that perfectly mix beauty with brains. This isn’t any other ‘quirky store’ with no value addition. Each product has a story to tell! The essential must-haves this festive season are the perfect jar lamps we all want to place by our bedside that can be converted into string lights. Their candle stand set comes in a set of three handmade and hand-painted candle stands. These can be bought individually as well as in a set, and are priced at INR 1,220 per stand. 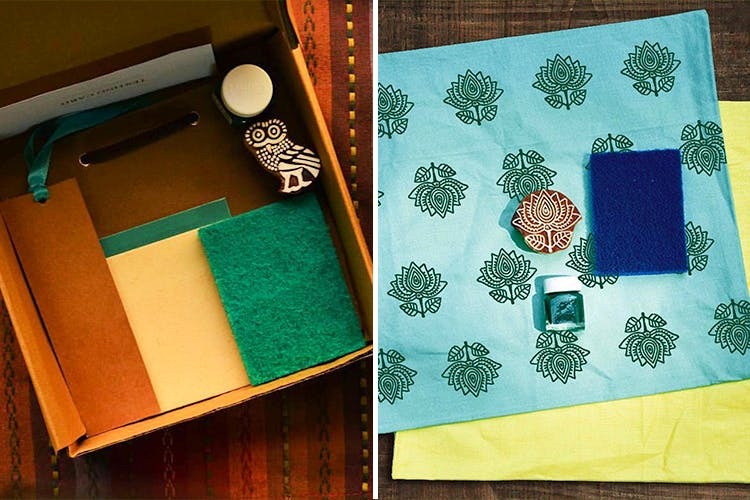 Besides these, they have amazing DIY kits that come with a wooden carved block to hand print on either stationery or cushion covers. These kits will cost you INR 975. To top all this, they have a couple of illustrated gift wrapping papers, which are so unique and have cute designs like candies, marshmallows and more. Aren’t these reasons more than enough for you to want to shop here? You can find these products to order on their website here. You could also simply glance through the images and order online from the maker's market here.